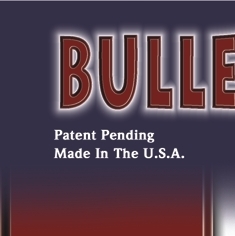 Our Bullet Lights are beautiful replicas of 20mm rounds that are commonly fired out of six-barreled 20mm guns that are capable of firing up to 6,600 rounds per minute. These General Electric M61A1 Vulcan cannons can be found on fighter jets such as the F-16, F-15, and F/A-18 in addition to being mounted on bombers such as the B-58 and B52H. The operation of these cannons are based on the principles used by Richard Gatling when he designed the “Gatling Gun” back in the 1860’s. Today, these 20mm cannons feature six rotating barrels that fire one at a time and can be driven electrically, hydraulically, or by a ram-air turbine. They can be mounted internally or in an external gun pod which can be mounted to almost any type of high performance aircraft. The Vulcan is one of the USAF weapons that served in Desert Storm and in Iraqi Freedom! Now you can have a beautiful machined replica for your office or home that will definitely be a conversation piece and serve double duty as a high-quality flashlight. 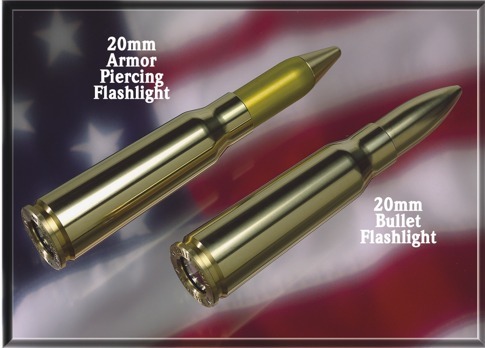 We have two different models; either our Bullet Light that replicates a standard 20mm round or our 20mm Armor Piercing round. These replica 20mm cannon shells are precision machined from a solid brass alloy using state of the art computerized machining centers. The beautiful brass finish can be kept polished or left alone to tarnish naturally – like a real shell! Simply twist the bullet end of the Bullet Light to turn on the flashlight beam.